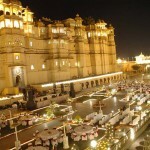 Almost all of us love to celebrate occasions in a royal approach, as a friend of mine invited me to the reception party of his marriage at Lake Palace, Udaipur. Being an addict to celebrations and an explorer, I packed my bags and planned a tour to Udaipur – ranked as 2nd best city in Asia and 7th in the world. As the function was organized in the splendid white marble structure of Lake Palace in the middle of Lake Pichola, I started my exploration from there only. This island kind of structure was established in 1746 and was called Jag Niwas. 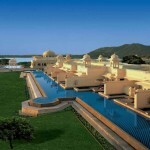 Recently, it has been converted to a luxury hotel under the property of Taj Group of Hotels. 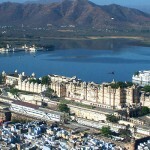 Next morning, I left for other major attractions in Udaipur. This royal city of Rajput Kings of Mewar has a huge 450 year old monument – the City Palace, located alongside the Lake Pichola only. I entered the palace through a triple-arched gate – Tripolia and came across lovely terraces, corridors and gardens. I clicked several wall paintings of Lord Krishna that were displayed in Bhim Vilas. Similarly, the architectural pattern of Dilkhush Mahal, Sheesh Mahal, Moti Mahal and Krishna Vilas were spellbinding. These grand palaces still retain the age old glory of bygone era in the form of antique articles, paintings, decorative furniture and utensils. In the evening, I visited Bhartiya Lok Kala Mandal for several folk art performances and puppet shows. After a tiring but enjoyable day, my last activity was boating in the splendid Lake Fateh Sagar. For dinner, I was served awesome Dal Bati Churma in my hotel. Next morning, I planned for a half day tour during which I paid short visits to Maharana Pratap Memorial, Saheliyon ki Bari, Sajjangarh Fort (summer resort of Maharajahs), Jagdish Temple (a perfect example of Indo-Aryan architecture), and Udaipur Solar Observatory (Asia’s only solar observatory). I had my lunch in Gulab Bagh (rose garden) where small restaurants serve tasty and spicy fast food. The trip was short but crisp. I marked all the untouched attractions for my next visit.